I have a 14” Pinebook prototype that was used for testing and QA at the beginning of the year. In the process of testing the unit got damaged and no longer works (which doesn’t matter anyways, as current images are not compatible with this hardware). Since it just sits there and takes up space, I figured that I will tear it down so we can better understand how these things are put together in case someone wishes to mod or repair their unit. Now, those more observant of you will surely notice that this 14” design is different to its production counterpart, and more akin in some respects to the 11” unit, so keep that in mind if you ever want to attempt any repairs or modifications on a production Pinebook. I think it important to mention that you should not reproduce this disassembly as it may damage your unit and will void your warranty. ... the keyboard, which is rather hard to remove from the chassis. Unfortunately I cannot embed pictures in this post so they will be hyperlinked. You can also find all pictures from the teardown here. The first thing I took apart was the screen (stupid of me - I should have removed it from the body first...oh well). The screen is held in place by plastic hooks which run all around the bezel of the screen. There are also four metal pegs holding it in place which located under the squishy pads / standoffs on each corner of the bezel. The plastic hooks release easily when a pry-tool is inserted but the metal pegs require considerably more force to come undone. If you do it super gently few marks will remain on the plastic. I can confirm that the construction is the same is true on the 11” production model. 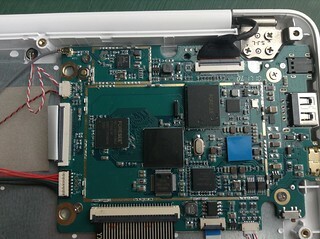 Inside, the LCD is held in place by four screws - 2 at the bottom and 2 on top. Other than that we also find the webcam, which is connected to the same cable as the LCD panel, and two magnets for the hall switch. That’s pretty much all there is - not that you would expect anything else. It appears that on the 11” production unit the wifi antenna is also routed inside the the screen, so one should be careful not to tear it by accident when separating the bezel from the back of the lid. To remove the screen from the body of the laptop - which I should have done in the first place - you will need to take of the bottom cover. The bottom cover is only held in place by 10 philips screws so it comes off very easily; lift it from the front and gently pull up. 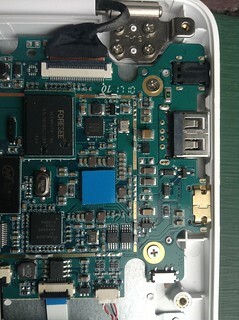 To separate the screen from the body, all that is needed is to undo the hinges on both sides and the screen connector located on the main board. The hinges are held in place with philips screws and come right out. After removing the screws, the hinges need to be carefully bent back to a 90* angle (as if the Pinebook would be normally used) and to separate the screen all one needs to do is push it away (back) from the body. If the hinges are ‘flat’ it is very difficult to separate remove the screen/ lid. Onto further disassembly. The first thing that needs to go is the battery. The battery connector on the main board pops up and out when gently lifted from the bottom. 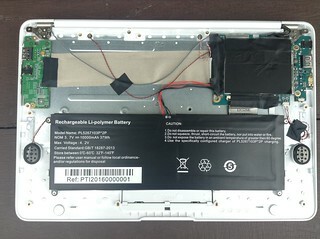 The battery itself is held in place by a couple of screws - there is no adhesive, so removing it is very easy. Next up the daughterboard on the left side of the body (when viewed upside-down from atop). It’s held in place by two large screws and some adhesive tape. There is only one connector for a ffc cable held down by a hinge that needs to be lifted. You will need to gently pull up and away from the plastic case to remove it, because the USB socket sits inside the plastic. Onto the main board. Here you will have to separate the 5 more cables (from left to right as viewed from atop): the microphone, cable running under the battery to the daughterboard, the microphone, the large flex cable is for the keyboard, trackpad and lastly speakers (LCD + camera and battery have already been removed). For the daughterboard, keyboard and trackpad cables, simply lift up the hinge and slide the cable out. For the microphone and speaker cables, wiggle the connectors out from their sockets (don’t pull by the cables - they look fragile). The mainboard is held in place by 4 more of those same screws as found on the daughterboard. To remove it from the chassis, lift it up on the far end of the board and pull away from the plastic where the Micro SD, USB and headphone sockets sit. Onto the keyboard. 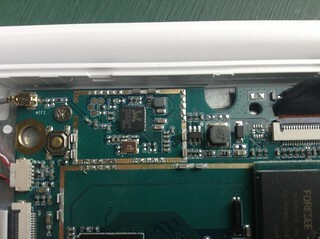 The keyboard is located under the metal cover which held in place by a couple of philips screws and plastic ‘tabs’. After removing the screws comes the hardest part of the disassembly as you will have to remove, one by one, all the plastic tabs protruding through the metal. I chose to cut of the tips of the plastic using a precision knife and it took me a long time. It’s clear that this part of the assembly was never meant to be removed by the end user (do note, I have since reassembled the keyboard and removing the plastic tabs has significantly affected the rigidity not only of the keyboard but also entire bottom section). Once all tabs are cut, you can lift it up and push it towards the back and the keyboard will slide right out as it is not held in place by glue or adhesive tape. About the keyboard; the keycaps come right off and snap back with ease. The keys have a butterfly-like assembly under which there is a dome. Back to the trackpad. To remove the trackpad I first lifted the a bottom lip using a pry-tool. It’s held in place with a lot of adhesive and quite hard to remove. Once the lip was out I pushed firmly in the place that the lip was protecting, towards the outside of the case. The trackpad is held in place with a lot of adhesive tape, so I ended up using a bit of hot air to make it come out. Lastly, there are the speakers. They are held down with adhesive but can easily be popped out by placing a pry tool in the cable-routing hole and gently pushing up. And so the teardown is complete. I also managed to reassemble everything without relative ease. I don't know if anything was broken in the process (other than the sturdiness of the keyboard) since the unit was already broken in the first place. If I were iFixit I'd probably rate this device a solid 10/10 because the unit is, for the most part, put together using regular screws and clamps which make things easy to remove and refit. Also, very little adhesive and glue was used on this particular pinebook which is a big plus for repairability. Just a note with regards to the 11" model... you mentioned for your 14" one that "The bottom cover is only held in place by 10 philips screws so it comes off very easily; lift it from the front and gently pull up, it will come right out with little to no force." That's not quite the case for the 11" one... it also has some snap catches around the sides which will hold it together even without the screws... and the ones nearest the front (front being where the trackpad is) are the most stubborn... I found some gentle and persistent sideways prying worked just fine to release the catches though. And yes, NEVER pull connectors out by the wires... always use a blade like a thin screwdriver to gently prise the connector plug from side to side (there's side tabs on this typeyp of connector for a reason! ), or some small long nose pliers if they will grab the connector properly. Pulling by the wires is just asking for the connectors to rip from the moulded connector, or rip out of the crimp. great set of pictures. lots of info in the post. too bad about that great sticker collection though, being that it has been retired. thanks for the work in putting this together. You are absolutely correct, thanks for pointing it out. I will amend that -- the reason why the bottom 'came right off' on my pre-production unit is 1) the quality and fitting of the plastic was a little poorer on the pre-production units; 2) I have taken it off many many times before because that was the only way to enter FEL on it to flash a new image. (05-11-2017, 05:44 AM)Luke Wrote: [ -> ] You are absolutely correct, thanks for pointing it out. I will amend that -- the reason why the bottom 'came right off' on my pre-production unit is 1) the quality and fitting of the plastic was a little poorer on the pre-production units; 2) I have taken it off many many times before because that was the only way to enter FEL on it to flash a new image. I've uploaded the photos I took the other night, plus some more I've just taken in better outdoor lighting, of the 11.4" production model internals for everyones viewing pleasure In pulling the pinebook apart for taking these photos, I have to again say I am impressed by the efforts they took to make it DIY friendly... machine screens with brass insert threads instead of course thread self-tappers, no fancy security screws on anything, the interference shields clip on instead of being soldered or tacked on, and all the ribbon connectors are taped to help ensure they don't pull free on their own. I noticed there there is both a momentary push button near the wifi section, and a slide switch down near the mini HDMI connector. Which one is used for FEL mode, and do we know what the other one does yet? 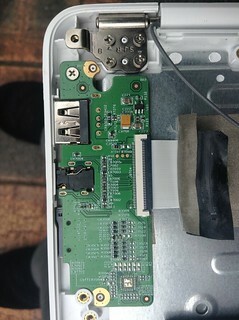 From the schematic on the pinebook resources section, it appears the push button is related to uboot (inset on page 5), and the switch is something to do with the microSD card but still uboot related (page 9)? If it was just the momentary push button that needed to be held down for FEL mode... I'd just measure it out on the back case and drill a hole so I can poke something suitablly non-conductive and skinny like a pen ink tube into the hole instead of having to disassemble the pinebook for fel mode. another good set of pictures, pfeerick. thanks. Yes, great set of pictures. And this is as far as anyone would actually want to go too realistically. (05-12-2017, 03:54 AM)Luke Wrote: [ -> ] Yes, great set of pictures. And this is as far as anyone would actually want to go too realistically. They're all on flickr, and are all being pulled in from that server, so only limitation is the number of characters you can put in a post.. as they're not attached to the post.